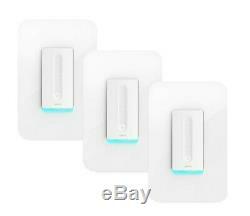 Wemo Smart Dimmer Light Switch F7C059-RM2-B (3-Pack) - GRADE A. Easily set the ambiance of any room and control your lights from anywhere with Wemo Dimmer. This smart Dimmer uses your existing home Wi-Fi network to provide wireless control of your lights from anywhere in the world. No subscription or hub is required: simply install the Dimmer and you can dim your lights from the wall, the Wemo app or with your voice using Amazon Alexa or Google Assistant. 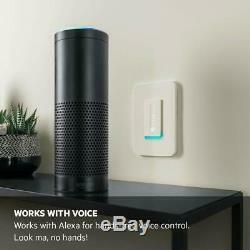 Enable Wemo skill in Alexa app to pair. With Wemo Dimmer, you can set worry-free schedules for your lights. Using the free Wemo app, you can schedule the dining room lights to turn on at sunset, or dim your lights to a soft glow just before bedtime. Optimized to Work with Your Lighting. Wemo Dimmer will optimize the dimming range to suit the specific type of bulb you're using. Whether you're using LEDs, CFLs, or incandescent bulbs, the dimmer delivers the maximum dimming range with no flickering. Night Mode for Late-Night Comfort. Want to prevent bright-light blinding when you're making a late-night trip to the kitchen or bathroom? With Wemo Dimmer's'Night Mode,' you can set your lights to turn on to a lower light level during specific times. When paired with an Amazon Alexa or a Google Assistant device, Wemo Dimmer gives you hands-free voice control over your lights so you can dim your lights using just your voice. Wemo Dimmer pairs with Nest to offer a range of automatic control options. Nest detects when you're home or away and syncs with Wemo Dimmer to turn living room lights off when the house is empty, or have your kitchen lights switch on before you come home. If This, Then That' is a free web-based service that lets you do amazing things with your Wemo. Turn lamps, fans, and other electronics on before you get home or off when you leave. With IFTTT, Wemo Dimmer can even wake you up with a soft glow in the morning instead of a loud alarm clock. Not compatible with 3-way (multi-location control) switches. Works with your existing single/double/multi-switch rocker-style plates. Not designed to work with metal face plates. What is in the Box. 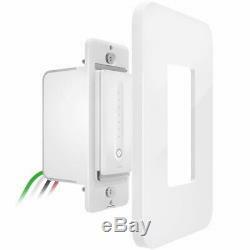 Wemo Dimmer (3) Face plate (3) Wire nuts Wire Labels. Grade A (Like New): No signs of wear scuffs, scratches, etc. From at least 12 away. Grade B (Very Good): Unit may come with some slight cosmetic defects (scratches, scuff marks, dents, bumps, discoloration). Grade C (Used/Good): Unit may come with some major cosmetic defects (scratches, scuff marks, dents, bumps, discoloration). Grade D: (Heavy wear or damaged but functional) Unit will have Scratches 3 or more inches, dead pixels or scratches that obstruct view, deep gouges, dents or cracks. DNF (Does Not Function): (Item does not work as it should) Physical damage that prevents full use of item, software issues that prevent item from operating. WARNING: This product may expose you to chemicals, including lead, which is known to the state of California to cause cancer, birth defects, or other reproductive harm. The item "Wemo Dimmer WiFi Light Switch (F7C059) 3 Pack, Works with Alexa & Google Assistant" is in sale since Friday, March 1, 2019. This item is in the category "Consumer Electronics\Surveillance & Smart Home Electronics\Other Smart Home Electronics". The seller is "geekdeal" and is located in Monroe, Washington. This item can be shipped to United States, Canada, United Kingdom, Denmark, Romania, Slovakia, Bulgaria, Czech republic, Finland, Hungary, Latvia, Lithuania, Estonia, Australia, Greece, Portugal, Cyprus, Slovenia, Japan, China, Sweden, South Korea, Taiwan, Thailand, Belgium, France, Hong Kong, Ireland, Netherlands, Poland, Spain, Italy, Germany, Austria, Bahamas, Mexico, New Zealand, Philippines, Singapore, Switzerland, Norway, Croatia, Colombia, Antigua and barbuda, Aruba, Belize, Dominica, Grenada, Saint kitts and nevis, Saint lucia, Montserrat, Turks and caicos islands, Barbados, Bermuda, Brunei darussalam, Bolivia, French guiana, Guernsey, Gibraltar, Guadeloupe, Iceland, Jersey, Cayman islands, Liechtenstein, Sri lanka, Luxembourg, Monaco, Macao, Paraguay, Uruguay.